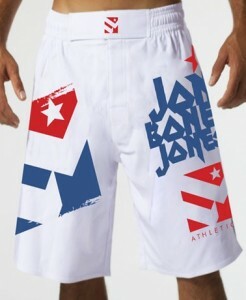 Check out the FORM Athletics Jon Bones Jones Fight Shorts! As worn by Jon “Bones” Jones in his very impressive performance against Vladimir Matyushenko during UFC on Versus 2. The promising 22-year old UFC lightheavyweight contender was signed by FORM Athletics, Urijah Faber’s clothing line. These shorts feature a waistband for a comfortable fit and high-quality screenprinting. An exact replica of the shorts that Jon Jones wears himself! Another Jon Jones product worth checking out is the Jon “Bones” Jones Walkout Shirt by FORM Athletics.